In addition to correcting the physical problems resolved by the database recover process, the rebuild process updates object information in a domain database (wpdomain.db) or post office database (wphost.db). However, the process requires that no GroupWise agents (MTA or POA) have access to the database during the rebuild process. Objects are not being replicated between domains. The agent that writes to the database went down unexpectedly. The server where the database resides went down unexpectedly. You receive a notification message informing you that an internal database error has occurred or there is database damage and you think there might be data loss. You ran the recover database process and received a notification of data loss. When you rebuild a secondary domain database, information is retrieved from the primary domain. When you rebuild a post office database, information is retrieved from the owning domain. IMPORTANT:If you need to rebuild a secondary domain database that is a version previous to GroupWise 2014 R2, use gwadminutil to rebuild the database. During the rebuild process, a backup of the domain or post office database is created as well as a new wpdomain.db or wphost.db. The records from the primary domain database are copied into the new wpdomain.db. There should not be any data loss. When the rebuild process is complete, the temporary database and the backup database are deleted. 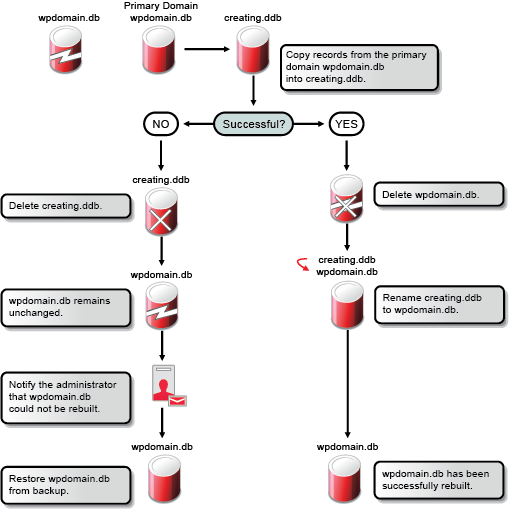 Ensure that you have sufficient disk space for the copy of the database that is created during the rebuild process. (Conditional) If you are rebuilding a secondary domain database, connect to the primary domain. NOTE:If you need to rebuild the primary domain database, you must use the GroupWise Administration Utility (gwadminutil). For instructions, see Rebuilding a Domain or Post Office Database in the GroupWise 2014 R2 Utilities Reference. (Conditional) If you are rebuilding a post office database, connect to the domain that owns the post office. Browse to and click the name of the domain or post office where you want to rebuild the database. From a domain, click Maintenance. From a post office, click Maintenance > Post Office Database. Stop the agent that accesses the database. If you are rebuilding a post office database, stopping the POA prevents users from accessing their mailboxes while the rebuild is in progress. If the task takes a while to complete, see Section 2.4, Monitoring Background Administrative Tasks. Click Close to return to the main Admin console window. Restart the agent that accesses the rebuilt database.